Mystery Nokia event reportedly set for September, is it tablet time? Is this really a leaked photo of a Nokia tablet? Will Nokia unveil its long-rumored tablet at a rumored New York event toward the end of September? That's what Windows Phone Central claimed this week in a report stating Nokia has an event planned for Sept. 26 through Sept. 27. Further details on the event itself are nonexistent, but the site speculated that the Finnish company is likely to finally unveil a Nokia tablet, maybe even a Lumia tablet, and we're inclined to agree with them. As WPC points out, Nokia's previous announcements in New York have been big ones like the Lumia 920 and Lumia 1020. And with the Lumia 925 being revealed in May and the Lumia 1020 in July, a September unveiling fits well with Nokia's reported strategy of a big new release every quarter. So why a tablet? A Nokia tablet has been rumored for a long time and as recently as May, the company admitted it's "very interested" in bringing a tablet to market. 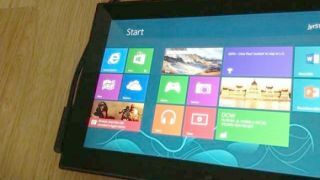 And just last month photos that allegedly show a Nokia Windows tablet surfaced on a message board. According to WPC's sources, that tablet is already in testing at several carriers, putting a September unveiling right on schedule. To top it all off, a mysterious Nokia RX-114 was supposedly spotted being benchmarked at gfxbench.com yesterday. The end of September may seem a long way off now, but if the circus leading up to the unveiling of the Lumia 1020 is any indication then we'll be privy to many, many more leaks as this supposed event gets closer. We asked Nokia whether it can share anything more concrete at this point, but we've yet to hear back. Don't want to wait for Nokia? We do have a hands on with the new Nexus 7 that may be a rival to Nokia if their tablet ever sees the light of day.